Xeniamaria Rodriguez joined the Children's Trust in 2018. 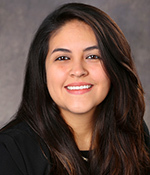 Ms. Rodriguez holds a Bachelor of Arts degree in psychology and international studies, as well as a Master of Science in public health, both from the University of Miami. For her master's thesis, she conducted a knowledge, attitudes and practices survey concerning the clinical management of dengue among pediatric health care providers in Santo Domingo, Dominican Republic. Prior to working at the Children’s Trust, Ms. Rodriguez served as a Zika senior health educator at the Florida Department of Health in Miami-Dade County, where she conducted epidemiologic surveillance, worked on research studies and provided education about Zika prevention. Ms. Rodriguez is passionate about achieving health and educational equity for children and families in Miami-Dade County.